The Internet of Things (IoT) impacts industries everywhere. It’s creating new opportunities to improve operations, enhance user experiences, and transform business models. The McKinsey Global Institute estimates a potential economic impact of as much as $11.1 trillion per year in 2025. Just like the commercial industry, the impact is also significant for the U.S. Federal government. 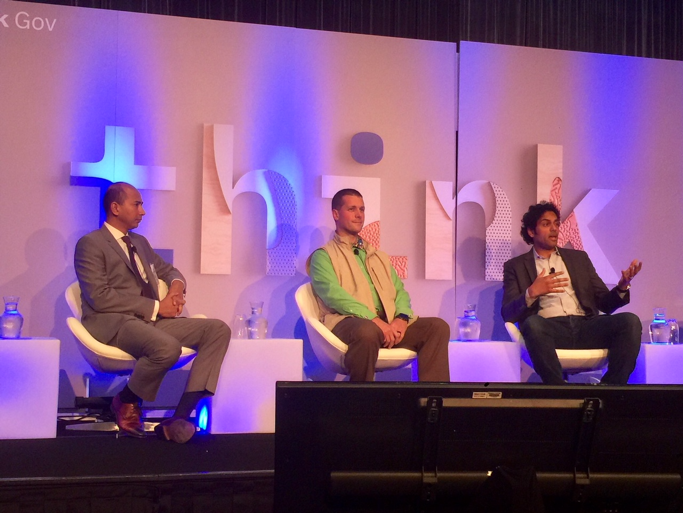 And it was a hot topic at the IBM Think Gov event, which took place at the Ronald Reagan Building in Washington D.C. on May 24, 2018. ThinkGov at the Ronald Reagan Building in Washington D.C.
IoT is often called the digitization of the physical world. Arguably, there is no greater steward of the physical world than the U.S. Federal government. That’s why leaders from across government used this event to discuss new technology. IoT, artificial intelligence (AI), augmented reality (AR), Blockchain, and Robotic Process Automation – these are all providing new paths to unlocking digital transformation in government. 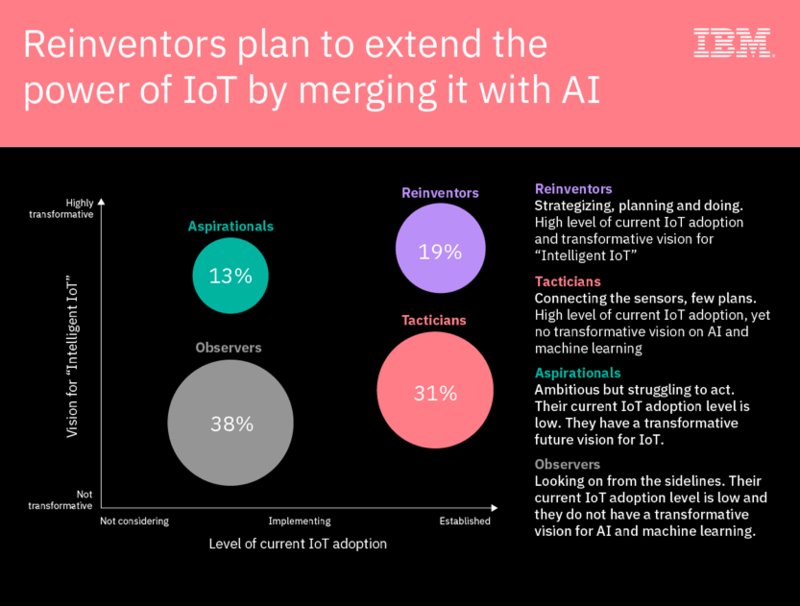 As the IBV study noted, the Reinventors have the highest levels of IoT adoption. They take a visionary approach to an Intelligent IoT strategy. While these IoT technologies might be considered “new” to some Federal agencies, there are already Reinventors who are using IoT to innovate their operations. They’re using technology to improve how they deliver their respective missions. Ultimately, it’s these same government Reinventors who will change how the world works. And if you’re interested, you can read more about Reinventors. Left to right, Dr. Joseph Ronzio, Deputy Chief Health Technology Officer, Veterans Health Administration, Landon Van Dyke, Senior Advisor, Energy, Environment & Sustainability, Department of State, and Marlon Attiken, Watson IoT Partner, IBM Services present how IoT is impacting government. Acceleration. The pace of technological innovation is not slowing. What is considered new and emergent today will rapidly become the new normal. What does this mean for a Federal agency? It means that the more quickly agencies can understand and apply technologies where it creates true value, the more prepared they will be to unlock innovation. They’ll also create new standards for excellence, allowing their Agency to move into an accelerated technologically driven future. IoT to the nth degree.There is a high degree of convergence of emerging technologies. No longer is the conversation just about IoT, but rather it is “IoT and ______” For example, IoT and AI, or IoT and blockchain. This tech convergence will continue to drive new value. For example, let’s take AI. Federal agencies that generate enormous data sets can use IoT to collect real-time, critical data. They can then exponentially enhance the power of IoT by applying machine learning to more quickly glean insights and actions from their data. Normalization of IoT. Some in the Federal community (and broader enterprise markets) may feel that IoT is a new way of applying technology to business. However, IoT applications are embedded in the DNA of many consumer applications today. Younger generations embrace these as part of everyday life. That means that IoT adoption is not a thing you go do; it’s that new normal. And it will keep giving us smarter homes and offices, connected vehicles and other social applications. This normalization of IoT will create a gravitational pull for Federal agencies and move them toward IoT applications of value. As almost everything becomes connected, IoT is changing how government agencies operate. The rapid acceleration in technology, the exponential power of IoT paired with AI, and the democratization of IoT into a new normal, are all driving Federal agencies to an inflection point. Reinvent or be reinvented. The key…get started. Find the right transformational use case, then explore and discover the art of the possible. Sure, there are risks like cybersecurity, and you have to thoughtfully consider them. But the sooner agencies embark on the journey, the quicker they will determine how digital technology can create transformational outcomes. Learn more about connected government. Marlon Attiken is a Partner within IBM Services. There, he leads the Watson Internet of Things (IoT) offering for U.S. Public Service. There, he focuses on creating client transformation through digital technology and platforms.